It is wet hop season, my favourite beer season. 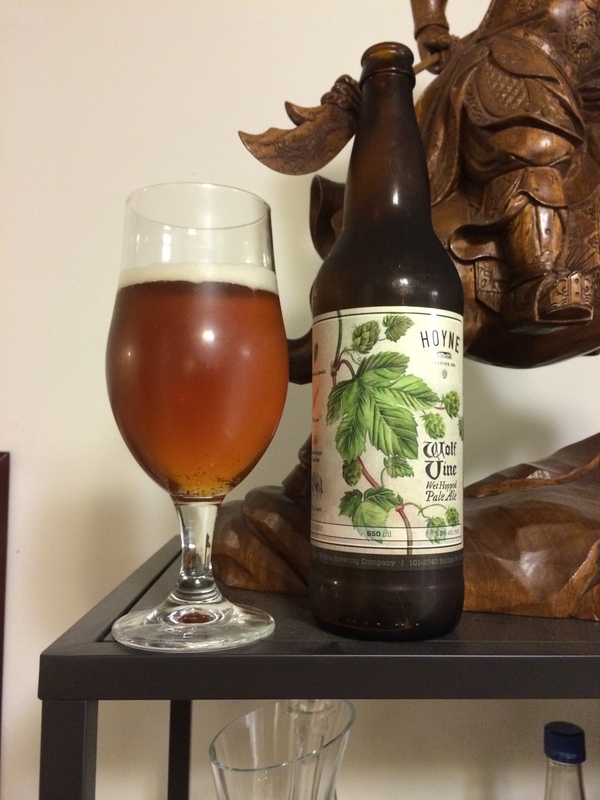 Just across Georgia Straight in Victoria, Hoyne Brewing’s wet hopped offering is their Wolf Vine Wet Hopped Pale Ale. First, this beer does not pour very pale, more of a copper colour with a tan head. While not cloudy it is not very clear either, just pleasantly hazy … that isn’t the right word but I can’t come up with a better one. The nose is full of hops, just what I want from a wet hopped beer. I get a lot of pine and resin, a little bitter herb and a sweet malt mash aroma to add body to the nose. For all the hop aromas they are not overwhelming, I don’t get hit in the face with them, they are nicely delicate. The very first taste is bitter, but it quickly gives way to a clean hay and grass flavour. There is a nice yeast funk that works its way to the surface of the flavours after a few seconds and brings a nice counter point to the malt. The malt is subtle under the hop, adding a little balancing sweetness and just a hint of caramel on the finish. Medium bodied, the carbonation is almost, but not quite, astringent, really waking up the tongue and the palate. I really wish this one could come out earlier in the year because it would be great on a hot day, it is clean and refreshing. I could see this paired with goat cheese or pasta in cream sauce. This entry was posted in Pale Ale and tagged bc, bitter, canada, caramel, grass, grassy, herb, herbal, hoyne brewing, malt, malts, malty, pale ale, pine, resin, sweet, sweetness, victoria, wet hopped pale ale, wolf vine we hopped pale ale.